Above: Travis Touchdown goes for two. That is some glowing praise. As time went on, I even came to think that I had underrated the game, scoring it an 8.5 out of 10. Though I make it a point not to get too excited about upcoming games, a sequel to No More Heroes seemed like a no-brainer. And, well, it is a no-brainer, in the pejorative sense. That's a little harsh, but I really didn't get that some sense of vitality and joy from Desperate Struggle that I did from the original. Even though the sequel has gotten better scores overall, 88 compared to the first game's 83, to me it didn't feel like it belonged in the same class. Oddly, I found myself making similar complaints about this game that reviewers did about the first one, and at the time I thought those reviewers were misguided. But there's a fine line between campy and just plain bad in any medium, and in video games that line is razor-thin. Say what you will about the clunky and sparse overworld of the first game -- at least you could get where you were going. Desperate Struggle adds some of the crappiest jumping I've ever encountered, and it's not to make a point. It's because this is a sequel, and adding useless new features is what you do in a sequel. I think it's time for a new IP from Grasshopper Manufacture. Most often the sequels don't come up to the expectation...or may be we expect too much from the sequels which is very very hard to meet. I agree. 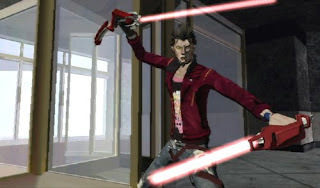 No More Heroes 2 felt like it missed the mark. The story was less interesting, and the crude humor was less funny/more embarrassing. It didn't work for me, which is a shame because the first one is one of my favorite games.